Luxury: the state of great comfort and extravagant living. Of course, this definition is relative; just as beauty is in the eye of the beholder, what constitutes luxury varies from person to person. When it comes to the Kelowna luxury real estate market, there are certain attributes that go hand-in-hand with calling a home a luxury listing. Location – Top luxury locations in Kelowna include waterfront, known luxury neighbourhoods or streets, and gated communities. The location of a luxury home is paramount when determining the price and market demand. Waterfront & Views – There are many neighbourhoods and areas in Kelowna, West Kelowna, Peachland, and Lake Country that offer spectacular panoramic views of Okanagan Lake, vineyards and mountains. Many luxury properties are located on local lakes providing a perfect waterfront experience. 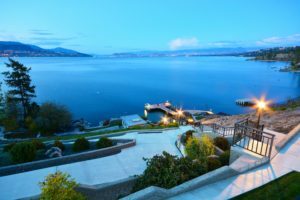 Waterfront properties and lake view homes are sought after qualities with buyers of Kelowna luxury real estate, and many include concierge services. Home Qualities – A perfected floor plan, comfortable size, and quality finishings help constitute the luxury characteristics of a home. The Kitchen – Luxury buyers are looking for stunning kitchen designs, with high-end commercial quality appliances, and plenty of space to unleash their culinary creations. Outdoor Spaces – Entertaining is a key element of the Okanagan lifestyle. Having outdoor spaces to gather with friends and family adds luxury appeal to a home. An outdoor kitchen, outdoor living, and dining spaces, a hot tub, and a pool are all key elements of luxury outdoor living in Kelowna. Luxury may be the unique location, the unusual assets, it may be the small or large details; but, whatever the definition, when it comes to selling a luxury property, it takes an experienced professional to understand the value in the details and how to market to qualified luxury buyers. Jane Hoffman Group has been marketing luxury real estate in Kelowna for decades. Our team of Kelowna realtors have a discerning eye and keen understanding of the luxury and lakefront real estate market. Our global network of luxury home buyers trust that we deliver quality homes and outstanding service. If you are considering selling your home, contact us to learn more about how our team will price and market your home to give you the best return on your investment. Lakeview Home with Pool. One of a kind lake view home in the prestigious neighborhood of Upper Mission. Architecturally inspiring home radiates warm, modern, West Coast allure and sophistication. Kelowna lakeshore estate property. A true piece of paradise! This rare lake front offering is one of a kind! This newly modernized luxury home offers over 10,000 square feet of quality and attention to every detail. 5 generous sized bedrooms and 6 full baths.